The two-hundred pounds of pressure flowing through the pipe had to be cut off before the flames could die down. Power has been restored to residents and the gas company expects to have the gas line operational again within a week. None of the reports say who the pipeline operator was, but PHMSA’s National Pipeline Mapper shows only one gas pipeline through Gilchrist County, the Florida Gas Transmission line running north to south right past Bell, Florida. Commissioner John Rance Thomas, representing District 4, reported the updated location of the gas line is nothing more than Sabal Trail deciding to take the path of least resistance. 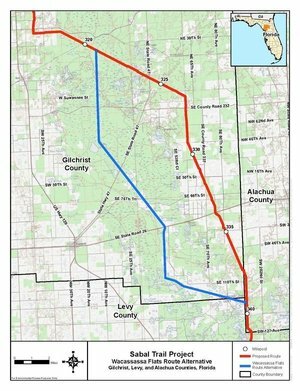 The latest proposed route will actually come into Gilchrist County just east of the two natural gas pipelines put in by Florida Gas Transmission. “I understand the updated route will be 150-feet east of the Florida Gas Transmission existing right-of-way,” Thomas said. He further explained the gas line will travel south to just south of CR 340 and east for a short distance where it will then turn southeast into an existing utility easement. The preferred route will then travel into the alternative route, (identified in red on the map) through the southeast portion of Gilchrist County. “Sabal Trail took the high and dry route, instead of working through the wetlands, they will stay in the sandy areas away from the less populated wetlands of the Waccasassa Flats,” Commissioner Thomas said. Sabal Trail didn’t pay any attention to the gas pipeline county committee, their going right where they wanted to from the beginning, Thomas said. And that’s after Gilchrist County’s citizen committee, Commissioners, and many others interrogated Sabal Trail for two hours 20 February 2014. In response to the Gilchrist County Board of Commissioners and to address concerns regarding the planned route’s impact on karst terrain, known springs, its proximity to residences, and its impacts on landowners, the Wacassassa Flats Route Alternative would deviate from Sabal Trail’s planned route at approximately MP 320.8 and extend 19.4 miles generally south and east through the area known as the Wacassassa Flats until rejoining the planned route at approximately MP 339.3. An explosion of 81 times as much gas as that 2012 explosion would still be an interesting task for Gilchrist County fire and rescue. Or Gainesville, like they had to call in back then. And for the taxpayers of Gilchrist County, Alachua County, Levy County, and the state of Florida.